Greetings from Bermuda's original karate dojo, Bermuda Karate Institute! BKI is dedicated to continuing training in the goju style of karate. Skipper Ingham, having completed over 50 years in some form of martial arts training, has renewed his dedication by visiting Okinawa five times in the last several years to renew contact with the Jundokan Dojo of the late Miyazato Eiichi. 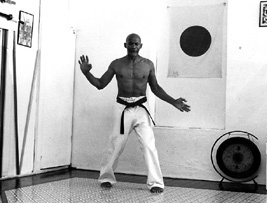 In 1997 he led a Bermudian team to compete in a world karate/kobudo tournament and experience the home of karate. Skipper Ingham received the Queen's Certificate and Badge of Honour in 1994. "I take this opportunity to thank the both of you for the wonderful contribution you have made to the youth of this country. Praise is too often wasted when given to politicians, doctors, lawyers, ministers, etc. The little people in their day to day struggle to teach discipline, respect, courage, truth and all the other attributes of good citizens are too often overlooked. In addition to teaching the traits listed above to so many Bermudians you have been sterling examples for your children to follow... I am always touched when I see the youngsters around your dojo as I pass down King Street. As long as we have epople like Mr. and Mrs. "Skipper " Ingham around, Bermuda doesn't have to worry about the future of its people." - Don Ray, D.C.
Skipper Ingham, Court Street dojo, 1984.